Hi! My name is Kristen Hills and I am so happy to be a part of the S’mores Saturdays party again this year. I blog over at Six Sisters’ Stuff with all 5 of my sisters. We love sharing easy delicious recipes that anyone can make! Hope you enjoy this Mini S’mores Cheesecake Recipe as much as we did! Mix together the graham crumbs and butter until well blended; press onto bottoms of 12 paper-lined muffin cups. Spoon 3/4 cup of heated Hot Fudge evenly over crusts. Beat the cream cheese and marshmallow creme in small bowl with mixer until well blended. Spoon into muffin cups; top with marshmallows. 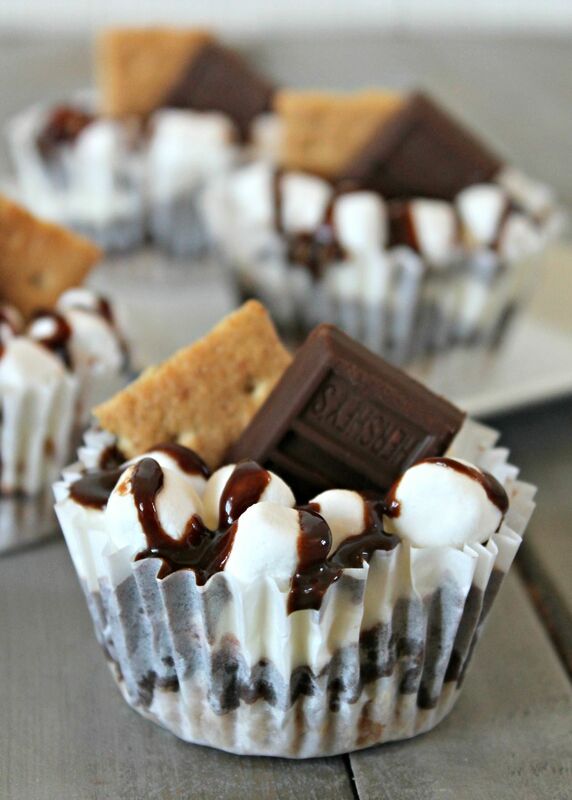 Drizzle with hot fudge and put a graham cracker and piece of Hershey’s chocolate in each one. Refrigerate 3 hours before serving.